Relax with a mix of solitaire and mahjong on Hawaii's golden sands. "I love this game. It's a change from regular solitaire. It's very relaxing and you don't have to rush and beat the buzzer. I would recommend to everyone." Immerse yourself in the idyllic Hawaiian Islands of Aloha Solitaire. Get away from it all without leaving the comfort of your home. Relax with a mix of classic card games and mahjong on the golden sands of Hawaii. 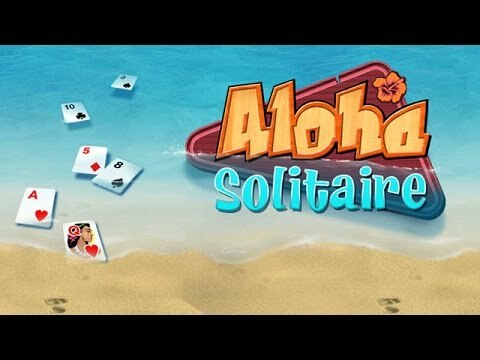 Aloha Solitaire can be played in two different modes, normal and hard. Power-up cards will help you get to the next level, but use them wisely, as they are limited. Every level has a different challenge and a different look. I am an old lady from Hawaii and love this game -- have played it for years. My old computer crashed and I was afraid I wouldn't be able to find it, but here it is and I can keep going. I find Aloha Solitaire to be very relaxing. It makes unwinding after a long day easy. I enjoy playing this game. It is a little different from the games I play -- I wish there were more card games. But this one I can sit for hours and play. Escape to a world of wonder with cleverly designed puzzle boards. Rebuild frosty locations with the spoils of your solitaire prowess. Explore solitaire favorites in the entrancing world of Howard Lovecraft. Rebuild gorgeous scenes as you follow passionate couples across the land. Lead your people to a land promised by the God Feyr.